The Advanced Cardiac Life Support (ACLS) course builds on the foundation of Basic Life Support (BLS) for Healthcare Providers skills, emphasizing the importance of continuous, high-quality CPR. This advanced course highlights the importance of team dynamics and communication, systems of care, and immediate post-cardiac arrest care. ACLS also covers airway management and related pharmacology. The ACLS course is for healthcare professionals who either direct or participate in the management of cardiopulmonary arrest or other cardiovascular emergencies. This includes personnel in emergency response, emergency medicine, intensive care and critical care units such as physicians, nurses, and paramedics, as well as others who need an ACLS course completion card for job or other requirements. To help students adequately prepare for the ACLS Course, the AHA highly recommends that each student complete the online ACLS Precourse Assessment, available through the AHA Student Website (www.heart.org/eccstudent). 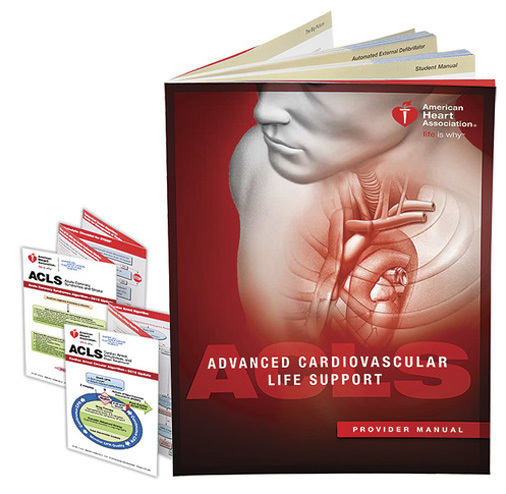 To access the AHA Student Website, students will need an access code, which is included on page ii of each ACLS Provider Manual. Students must hold a Current American Heart Association BLS for Healthcare Provider CPR card to take the course. If expired, you must complete the BLS for Healthcare Providers course completion challenge testing during the Advanced Cardiovascular Life Support (ACLS) and written exam, an additional $42. If you do not have an American Heart Association BLS Healthcare Provider card you must take a full course. Students must pass a written exam and megacode skills test in order to qualify for an ACLS Provider Course Completion Card. Course length Approximately 9-12 hours. Approved by the American Heart Association, an organization accredited by the Continuing Education Coordinating Board for Emergency Medical Services (CECBEMS), for 12.00 Advanced CEHs, activity number 17-AMHA-F2-0119.